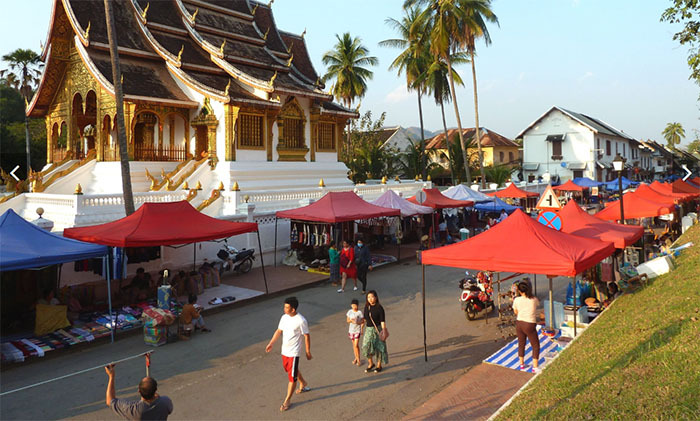 Luang Prabang night market, situated in the most popular part of Luang Prabang, is easily accessible, it is one not to be missed when visiting this charming city. The night market is one of the biggest tourist markets in Southeast Asia. The market is open daily from 5pm to about 10pm. It is located along Sisavangvong Road from the Royal Palace Museum, see map. Every evening a kilometre-long stretch of road is closed to vehicle traffic and turned into a walking and shopping street while the market takes place. It's an amazing sight and offers the most extensive collection of local handicrafts, decorative items and home textiles in the country. 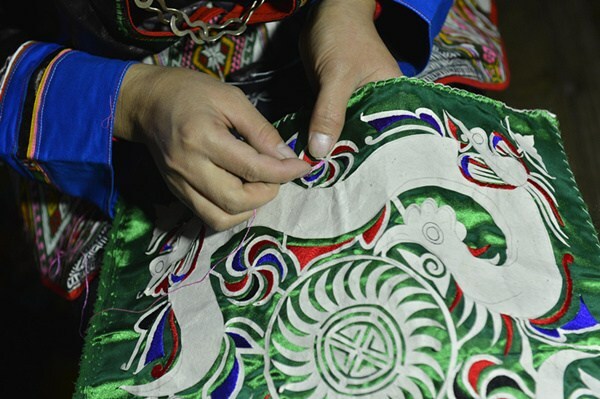 It is said to be one of the best night markets in Asia because items are mostly handmade, therefore are more unique than the mass produced items that get sold elsewhere. Hundreds of handicraft vendors sell their hand-made products here every night. 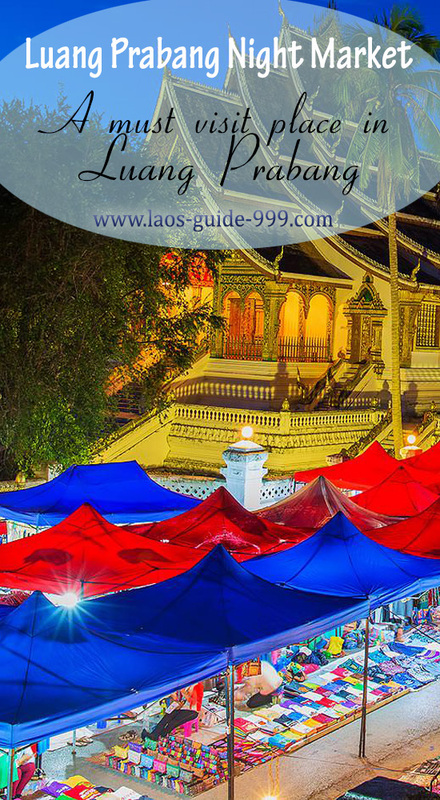 The Luang Prabang night market showcases an extensive variety of handicrafts made by local ethnic groups. On display are many types of textiles, exquisite ceramics, antiques, paintings, coffee and tea, quilts, shoes, silver, bags, bamboo lamps of different shades and sizes, soft toys jewelry, wooden crafts, slippers, aprons, smoking pipes, lanterns….you name it. There are even items that you may not imagine would be available or that you will not want to buy such as snake, gecko wine or even animal’s teeth. There are a lot of interesting items on display at the night market that are hard to find elsewhere. Best of all there is almost no pushiness so… you won't get shouted at to come buy something like you will find in other Asian countries, the vendors are friendly and helpful so you can just stroll through and leisurely choose and decide what you are interested in. The traders quote quite low prices considering most of the items are handmade. So even if you're not good at bargaining, you can be sure that you will get good value. But if you enjoy or want to practice your bargaining skill why not, though don't expect huge discounts. For those who are not into shopping, just wandering around chatting with the vendors will enrich your Lao cultural experience. What most shoppers like about the traders here (as well as in Laos as a whole) is that they don't force people to buy anything in anyway, but many customers may find this strange or view the traders as lazy or not interested in the customers. I can assure you that if you ask about their merchandise most will be cheerfully accommodate your query. In general Laotians are not pushy type of people, that is! Most local traders in the Luang Prabang night market speak little English.The market is also filled with T-shirts bearing Luang Prabang iconography, and prints and paintings that capture the town’s characters. Food and drinks are also available though there is a separate alleyway nearby that stuffed with food stalls selling more variety of food. If you want to taste local food, this is a place to start, there is a large variety of Lao food ranging from BBQ chicken and sticky rice to a well stocked vegetarian buffet for you to choose from. Taking a leisurely walk through the Luang Prabang night market is an enjoyable experience in itself. It is not unusual to lose track of time while you stroll amongst the stalls. In facts if you look around, you will see many tourists moving slowly, seemingly transfixed while enjoying their shopping.